Our Lady of Battle Hill Shrine is located at the top of the hill in the village of Soubise, in the parish of St. Andrew’s, in the island of Grenada, West Indies. 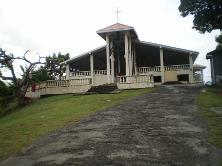 The building of the small church or chapel was started in 1955 and completed in December 1957. The construction of the building was supervised by Father Kevin Clarke OP but the actual building was done by a woman, a very devout Catholic, Mrs. Lewin Harvey. Church activities included Eucharistic Mass and Service; baptism, first communion and confirmation classes and harvest in order to raise much needed funds. The pilgrimages started with a vision that Mrs. Elena Pierre had in which Our Lady called out to her and showed her a church and said to her ‘you see this building, don’t ever keep it closed’. Not knowing the location of the church in the vision, she journeyed throughout Grenada until the church on the hill was found in the same spot, shape and colour as was seen in the vision. 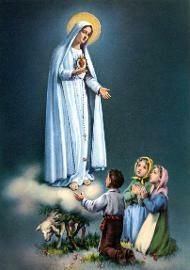 In response to the request by Our Lady and plans within the Diocese, pilgrimages to Our Lady were held monthly from May to October, every 13th of the month closest to the Sunday. Devoted Catholics throughout the island would journey from the Old Church in Grenville to Battle Hill saying the Rosary and singing hymns to Mary, where Holy Mass would be held by the Bishop of the Diocese at Battle Hill church. The church now became a Diocesan shrine which saw the successful formation of the Legion of Mary Group, a prayer group, a youth group, Sunday school and church committee from among the members of the worshipping community. Fifty-two years after the first church was built, the vision to keep the building open is now being fulfilled. Seeing the urgent need for evangelization and other forms of ministry in the Shrine, the Bishop of the Diocese, Bishop Vincent Darius OP, sought The Congregation of The Handmaids of The Holy Child Jesus assistance for help. As a result, three Sisters were sent out from Nigeria on 3rd December, 2009. The Sisters of the Handmaid of the Holy Child Jesus Congregation has taking up their residence next to the Shrine in March 2010 to implement a program of spiritual and social activities for the people of Grenada, Carriacou and Petit Martinique.